The United Launch Alliance Delta IV Heavy rocket launches NASA's Parker Solar Probe from Launch Complex 37 at Cape Canaveral Air Force Station, Florida. Credit: NASA/Bill Ingalls. 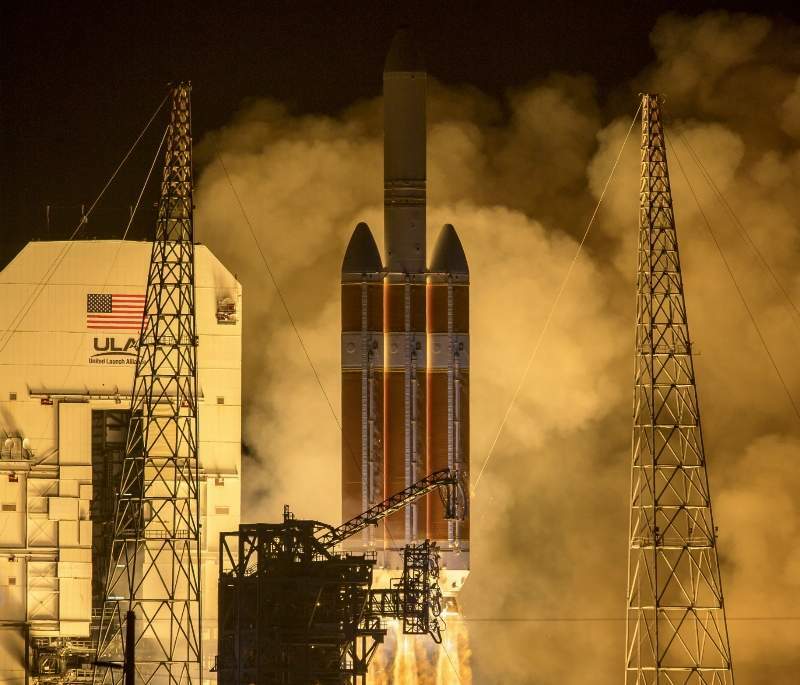 The United Launch Alliance (ULA) has launched NASA’s Parker Solar Probe into space from Space Launch Complex-37 at Cape Canaveral Air Force Station in Florida, US. Launched onboard ULA’s Delta IV Heavy rocket, this mission intends to study the solar atmosphere, known as the Sun’s corona. Part of NASA’s Living with a Star programme to explore aspects of the Sun-Earth system that directly affect life and society, the Parker Solar Probe is equipped with four instruments to study magnetic fields, plasma and energetic particles, as well as capture images of the solar wind. In addition to designing and building the Parker Solar Probe, Johns Hopkins University Applied Physics Laboratory (APL) will operate the instrument. APL project scientist Nicola Fox said: “Exploring the Sun’s corona with a spacecraft has been one of the hardest challenges for space exploration. Measuring the size of a small car, the Parker Solar Probe will deploy its high-gain antenna and magnetometer boom in the first week of its seven-year journey. The spacecraft is also expected to perform the first of a two-part deployment of its electric field antennas, as well as begin instrument testing by early September for a period of around four weeks. By early October, the Parker Solar Probe is set to fly towards Venus to perform its first Venus gravity assist, which will manoeuvre the spacecraft around the planet to reduce its orbit around the Sun. This planned flyby is expected to place the spacecraft in position in early November to fly as close as 15 million miles from the Sun, which is closer than any other spacecraft sent to study the star. During the course of its mission, the Parker Solar Probe will make six additional Venus flybys and a total of 24 passes by the Sun, gradually moving closer until it makes its closest approach at 3.8 million miles. Data from the spacecraft are expected to help researchers improve forecasts of various space weather events that could damage satellites and harm astronauts on orbit, disrupt radio communications, and others.